LonWorks® is the latest in microprocessor technology that gives the user the highest level of application flexibility. A large graphic screen, multiple inputs and very easy setup, with easy field upgrade characterize this new technology. This controller can be used in the Continuous Sample, or Sample/Cycle modes to control the boiler water conductivity. Cycle/Sample or Continuous sample control of blowdown, configurable in the field. Two water meter inputs, conductivity input with 20 ft cable, flow switch input, four relay outputs, and Power On/Off switch in a NEMA 4X enclosure are all standard features. Includes four relays for blowdown, chemical feed, and alarms; expandable up to 12 relay outputs. Accurate control of boiler conductivity. Two water meter inputs provided for accurate chemical addition. 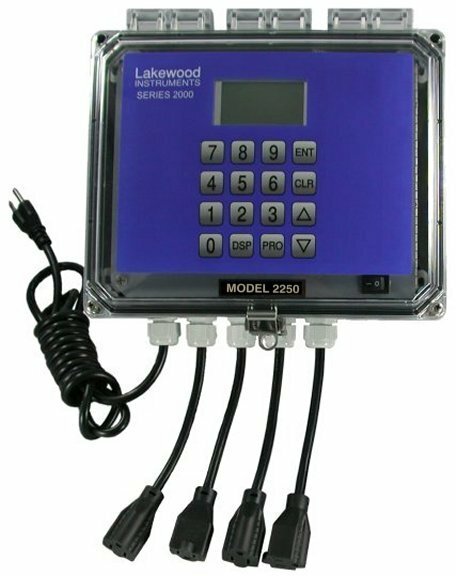 2250e LonWorks Technology-based cycle sample or continuous blowdown conductivity controller. Range is 0-8,000 µS, has HIGH/LOW alarms, water meter inputs and chemical feed relays. Requires SR2 or SR4, below, and PL5 or PL6 is recommended. -NIN Network interface node. Allows 2 NRLY, 1 Makeup NCON, 4 sensor nodes (NpH or NCON), 2 N420I, and / or 2 NDIG to be added. NRLY Four additional relays with enclosure, also available with receptacles and power cord. -EF English and French.-EG English and German. SR2 Boiler water sensor with condulet, ¾ inch NPT; rated to 600 psi @ 486°F (41.4 bar @ 252°C). This sensor cannot be used after a sample cooler. SR4 4-electrode sensor with ¾ inch NPT; rated to 250 psi @ 392°F (17.2 bar @ 374°C). PL5 Plumbing for cycle/sample assembly ½ inch (1/8 & 1/16 orifice plates and union). PL6 Plumbing for continuous sample assembly, ½ inch (1/8 & 1/16 orifice plates & union). PL575 Plumbing for cycle/sample assembly ¾ inch (1/8 & 1/16 orifice plates and union). PL675 Plumbing for continuous sample assembly ¾ inch (1/8 & 1/16 orifice plates & union). PLKT Plumbing kit. Continuous and sample cycle. Orifice plates and unions, cross, tee, manual block valve. No piping. GV ½ inch forged globe valve for flow metering instead of an orifice plate and union. NOTE: Two GV options are required for continuous sample and one for cycle sample if the orifice plate and union are not used. MBV1 Motorized ½ inch blowdown valve rated to 400 psi @ 480°F (27.6 bar @ 249°C). MBV2 Motorized ¾ inch blowdown valve rated to 400 psi @ 480°F (27.6 bar @ 249°C). manual block valve only. Does not include piping.